Mark Young of the Wm. 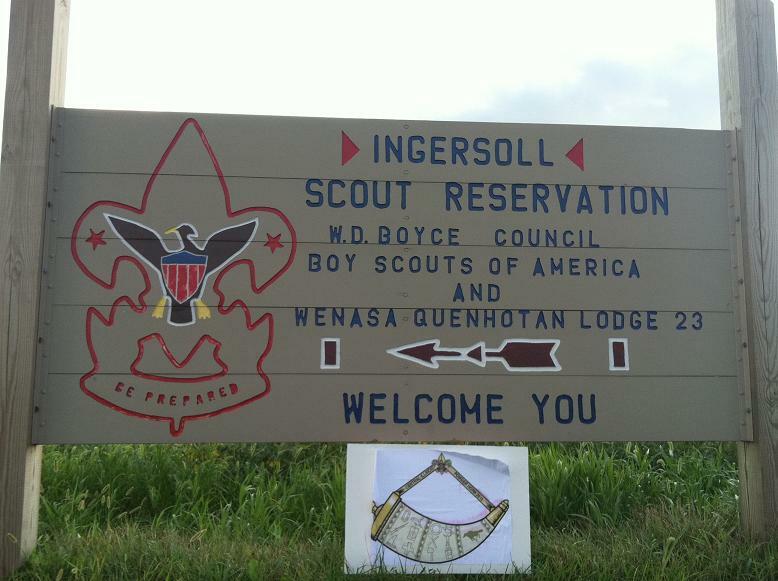 D. Boyce Council, BSA, asked me to present some wilderness survival skills at their Powderhorn training, held at Ingersoll Scout Reservation in London Mills, Illinois. There were about 30 adults and 8 youth who attended this training. Sorry...I was busy teaching so I only took a few pictures, and I misplaced my camera, so I had to rely on my phone's camera. Camp sign on Illinois Rt 116, just west of London Mills. 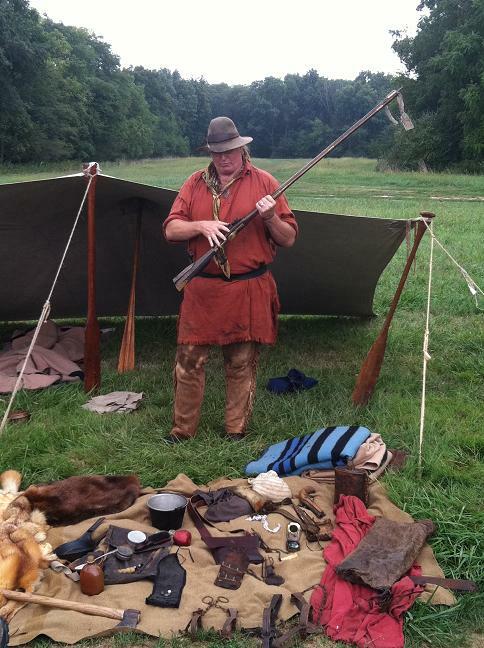 The morning was spent with a round robin of living history, including a Civil War Union doctor reenactor, a Civil War confederate soldier reenactor, and two mountain-man era reenactors. All of the equipment is hand made. (I was coveting the oil-skin haversack.) 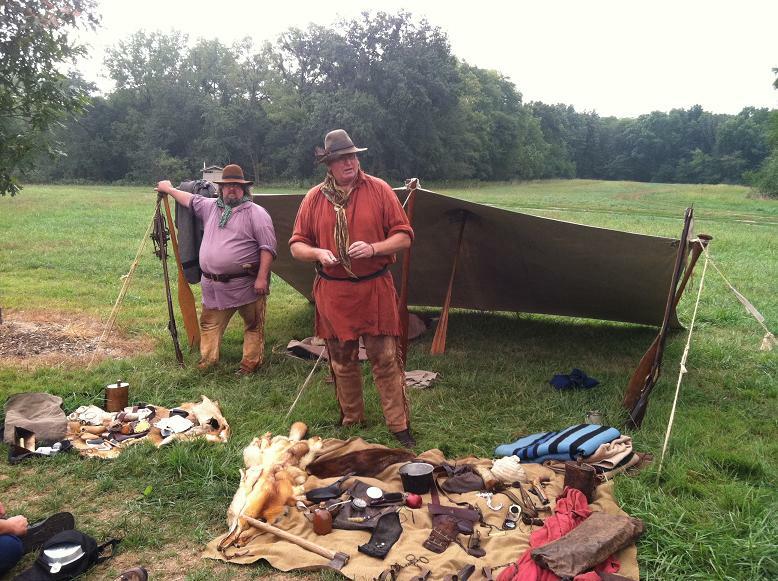 They were very knowledgeable about the mountain man era, and they like to inform their audience and dispel the myths which are perpetuated by Hollywood about mountain men. 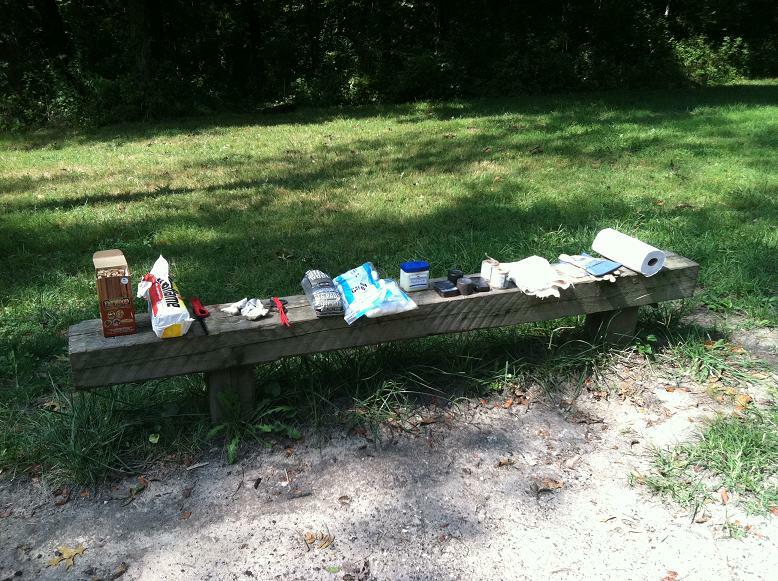 Equipment for my demonstration: Fatwood, fireplace log, lighter, flint (cherp), strikers, steel wool, cotton balls, petroleum jelly, cans (to make char cloth), jute twine (for tinder), canvas (to make char cloth), leather gloves, paper towels. Not shown: ferrocerium sparking rods and scrapers. I only had one hour for each group. After demonstrating as many techniques as time would allow, I asked each person to attempt at least one thing they had never done before. I think most people did at least one new skill, and many did more. 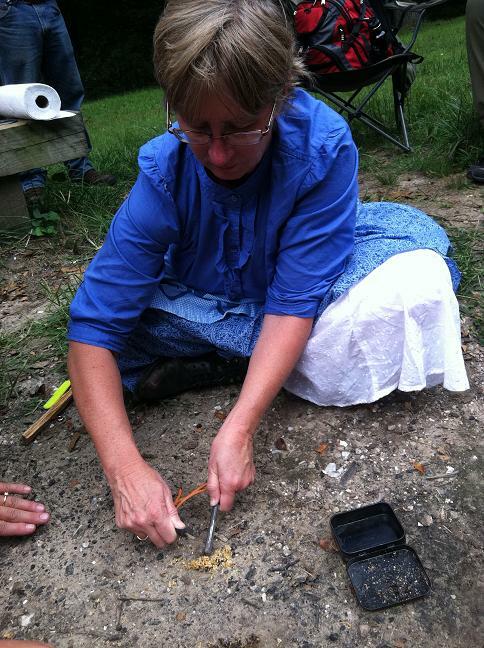 This woman started a fire with fatwood dust and a sparking rod. 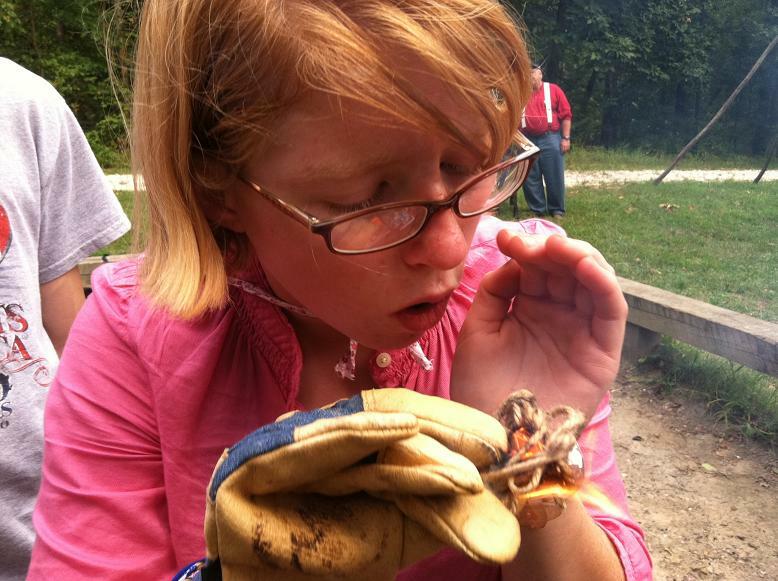 This young woman started her first-ever fire with flint and steel and char cloth! Not related...but on the way home the next day, I avoided the interstates and drove Rt. 34 all the way from Galesburg to Plano. 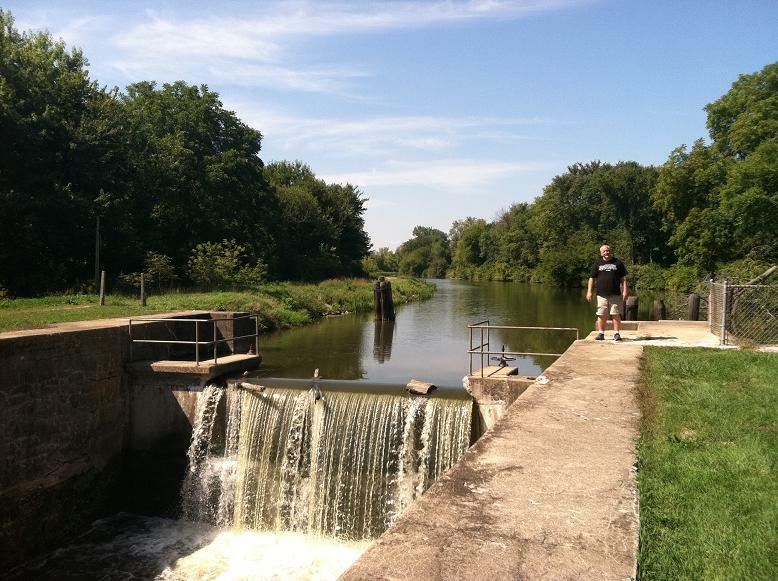 This is Hennipin Canal Parkway, Lock #21, on Rt. 34 just west of Princeton. There is a bike path here, and camping and fishing. I hope to return here sometime! Thank you to the Powderhorn staff for the invitation, and to the scouts and scouters for their enthusiastic participation. Copyright © 2011 by Bill Qualls. Last updated September 11, 2011.